Philippians 4:6-7 Do not be anxious about anything but in every situation, by prayer and petition, with thanksgiving, present your requests to God. And the peace of God, which transcends all understanding, will guard your hearts and your minds in Christ Jesus. 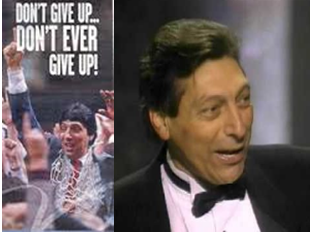 I wholeheartedly agree with Jimmy V’s philosophy of “Don’t Give Up . . . Don’t Ever Give Up.” Notably he ended by asking God to bless all, so now I encourage you to receive God’s blessings to face your battles by waiting upon Him, by standing still in Him and by praying with thanksgiving to Him.